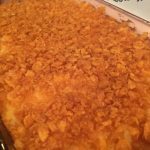 This Hashbrown Casserole Recipe is the perfect complement to many dinner dishes, and is a MUST HAVE for Easter, Thanksgiving, and Christmas! When my family eats dinner at a national family friendly restaurant, a favorite side dish to order is Hashbrown Casserole. I have seen a few variations around, but none that everyone in my family loved as much as the restaurant version. Finally, after a few rounds of trial and error, this is the result that works best for us. Best of all, everyone says it tastes BETTER the 2nd day as leftovers. One 9×13 size dish is the perfect size for 2 meals (until the boys get a little older! ), so I always plan back to back meals that this will work well with. 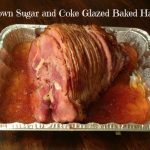 This is also an excellent choice for potluck dinners, and Handi-Foil pans work very well so you don’t have to worry with clean up or keeping track of a dish! Spray your pan with non-stick cooking spray. Saute your onions in a sauce pan with a dab of butter, until they are clear. Next, prepare your hash browns. I have found that 1/2 bag of frozen hash browns, un-thawed in the refrigerator the day you are cooking, works best for us. Some may prefer fresh potatoes. Mix your soup, sour cream, melted butter, salt & pepper, cheese, and sauteed onions in a bowl, add in the hash browns to mix well, then pour into the baking dish. Place in the oven and bake at 350 for 1 hour. Meanwhile, crush your Corn Flakes into tiny bits. I use my clean hands, and it works best in my measuring cup. Melt your butter on the stove and then pour over the corn flakes, mixing well. When the hour is up, remove the dish from the oven, pour the cornflake mix on top, spreading the entire pan, and return to the oven for 15 minutes. Saute your onions in a pan with a dab of butter, until they are clear. Prepare your hashbrowns. I have found that 1/2 bag of frozen hashbrowns, un-thawed in the refrigerator the day you are cooking, works best for us. Some may prefer fresh potatoes. Mix your soup, sour cream, melted butter, salt & pepper, cheese, and sauteed onions in a bowl, add in the hash browns to mix well, then pour into the baking dish. Place in the oven and bake at 350 for 1 hour. Crush your Corn Flakes into tiny bits. Melt your butter on the stove and then pour over the corn flakes, mixing well. When the hour is up, remove the dish from the oven, pour the cornflake mix on top, spreading the entire pan, and return to the oven for 15 minutes. Disclosure: Handi-Foil provided me with the pan to bake this in. All thoughts and opinions expressed are my own, and I was not influenced in any manner. Posts may contain affiliate links. If you purchase a product through an affiliate link, your costs will be the same but When Is Dinner will receive a small commission. This helps cover some of the costs of running this site. We appreciate your support! This is very similar to the ‘Cheesy Potatoes’ that I make, with a few differences. I’ll have to try these, as we love to mix it up a little and try something new once in a while. Thanks for the recipe!! 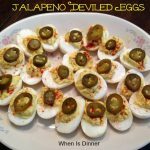 Ohhh these look amazing… I bet it would be good with cheddar cheese soup! Found you at the link up! 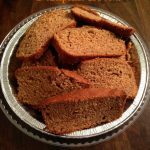 I saw you shared this recipe at the Flour Me with Love link party. 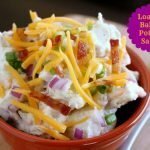 I have a new link party on my website, Required Ingredient Recipe Link Party…and this week’s featured ingredient is potatoes. 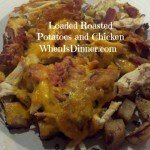 I hope you’ll pop over and share this recipe, and any others you just love that have potatoes in them. Oh my heck. Now I’m hungry that looks so delicious. Thanks for the recipe. I love these potatoes. 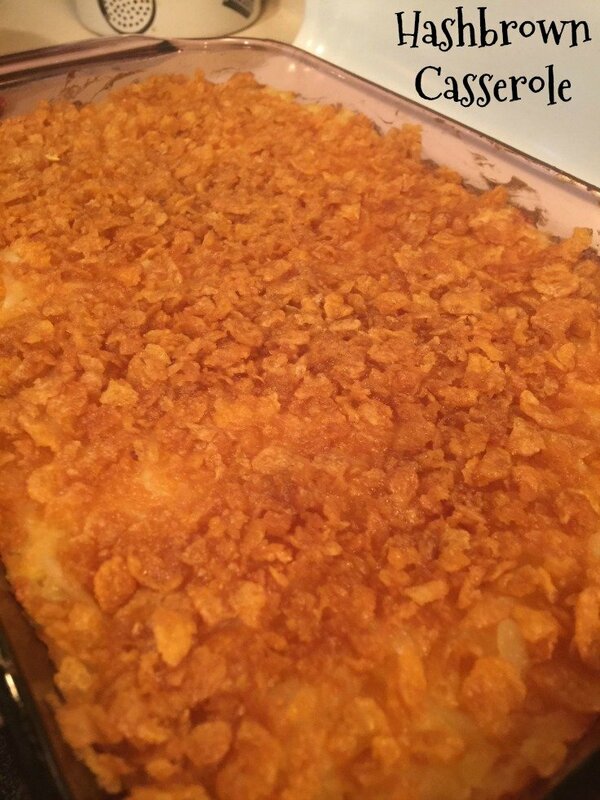 But I know them as Funeral Potatoes as they are always served as the side fish to Ham. I usually make Hashbrown Casserole for Thanksgiving but I do it a little different using Cream of Mushroom soup instead. I like this different twist and am going to make it for this holiday season! Thanks so much for the recipe! This is one of my family’s favorites. I do it a bit different but we love it.